Customer Analytics: The processes, technologies, and enablement that give brands the customer insight necessary to provide offers that are anticipated, relevant and timely. 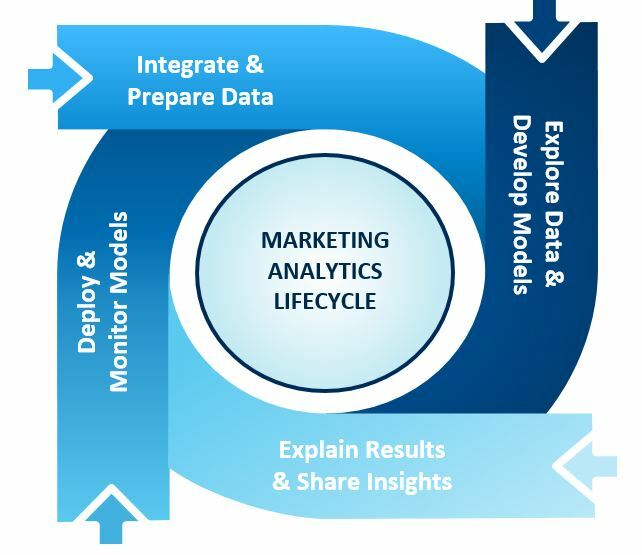 Marketing Analytics: The processes and technologies that enable brands to assess the success of their marketing initiatives by evaluating performance using important business metrics, such as ROI, channel attribution, and overall marketing effectiveness. Customers are more empowered and connected than ever before, with access to information anywhere, any time – where to shop, what to buy and how much to pay. Brands realize it is increasingly important to predict how customers will behave to respond accordingly. Simply put, the deeper your understanding of customer buying habits and lifestyle preferences, the more accurate your predictions of future buying behaviors will be. Data is a big challenge. As customer interactions with brands increase and diversify, brands need to integrate data effectively in order to provide the contextual and real-time insights their customers are growing to expect. Haven't you grown tired of saying we spend 80 percent of our time on data management related tasks, and 20 percent on analysis? Customer analysis touches all of these roles, and to enable this audience comprehensively, all aspects of the marketing analytics lifecycle must be supported. To directly address this, I want to to highlight what SAS is doing to help our clients meet these challenges. Some of you might be questioning the value of this, so let me offer a different perspective. Over the past few years, I have developed a personal frustration of attending various marketing conferences and repeatedly observing high-level presentations about the potential of analytics. Even more challenging has been the recent trend of companies presenting magical (i.e., "easy-button") black-box marketing cloud solutions that address every imaginable analytical problem; in my opinion, high-quality advanced analytics has not reached a point of commoditization, and remains a point of competitive differentiation. Do not be mislead by sleight-of-hand magic! 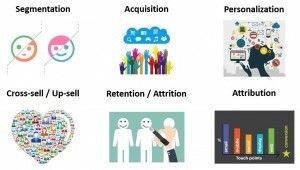 What types of marketing challenges are you attempting to solve with customer analytics? Srividya Sridharan and Brandon Purcell are two leading researchers in the space of customer insights, and recently released a report entitled How Analytics Drives Customer Life-Cycle Management recommending the deployment of various analytical techniques across the customer life cycle to grow existing customer relationships and provide insight into future behavior. Highly recommended reading! Let's review some of the most common problems (or opportunities) we view at SAS with our clients. 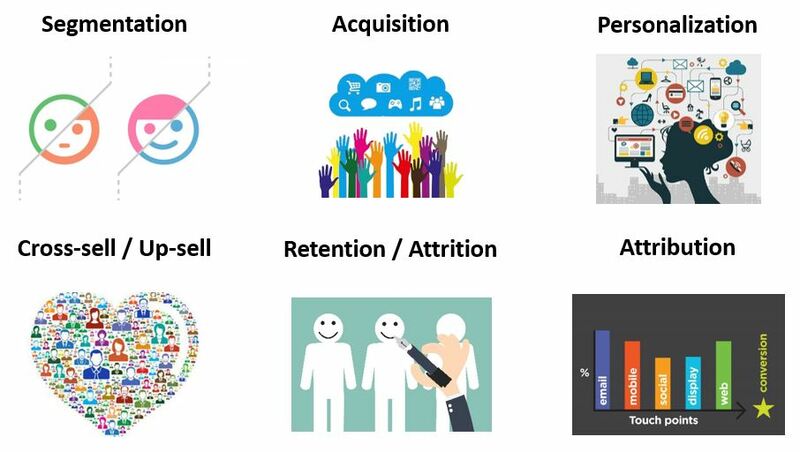 Within each of the categories, a myriad of analytic techniques can be executed to assist and improve your brand's abilities to address them. The following video is a demonstration of how I used SAS Visual Statistics and Logistic Regression analysis to understand drivers by marketing channel of business conversions on a website or mobile app. The benefit of understanding these data-driven drivers is to influence downstream marketing personalization and acquisition campaigns. In addition, capabilities related to group-by modeling, deployment scoring and model comparison with other algorithmic approaches are highlighted. Big digital data, scalable predictive analytics, visualization, approachability, and actionability. Stay thirsty my friends, because it is our clients who are expressing their needs, and SAS is stepping up to meet their challenges! With that said, we have one final stage of the lifecycle to review. An individual's ability to communicate clearly, succinctly and in the appropriate vernacular when presenting analytical recommendations to a marketing organization is extremely important when focused on driving change with data-driven methods. I recently wrote a blog post on this topic entitled Translating Predictive Marketing Analytics, and if you're tired of reading, here's another video - this time focused on explaining the results of analytical exercises in easy-to-consume business language. As I close this blog post, I want to leave you with a few thoughts. For your brand's customers, technology is transparent, user-enabling, and disintermediating. The journey they embark with you on is fractured and takes place across channels, devices, and points in time. The question becomes – are you prepared for moments of truth as they occur across these channels over time? Customer analytics represents the opportunity to optimize every consumer experience, and revisiting a point I made earlier, the deeper your understanding of customer buying habits and lifestyle preferences, the more accurate your predictions of future buying behaviors will be. The analytics of customer intelligence and why it matters was published on Customer Analytics. With careful consideration towards the areas of data management, data integration, and data quality, analyzing customer-centric (or visitor-centric) channel activity on their journeys to making a purchase with your brand can have immense benefits. Ultimately, marketers desire to apply a percentage value that can be attached to each channel's contribution to the purchasing event (or revenue). This is critical, as it allows the organization to determine how important each channel was in the customer journey, and subsequently, influence how future media spend should be allocated. Allocates 100% of the credit to either the last or first touch of the customer journey. This approach has genuine weaknesses, and ignores all other interactions with your brand across a multi-touch journey. It is stunning, in my opinion, that web/digital analytic technologies have traditionally defaulted to this approach in enabling their users to perform attribution analysis. The reason for this was last/first touch attribution was easy, and could claim ownership of the converting visit (although that is only partially true). Thankfully, times are changing for the better, and this rudimentary approach has proven ineffective, guiding marketers (for the sake of job security) to try more intelligent methods. Arbitrarily allocates an equal credit weighting to every interaction along the customer journey. Although slightly better than the last and first touch approaches, linear attribution will under-credit and over-credit specific interactions. In a nutshell, it over-simplifies the complex customer journey with your brand. "There’s really no reason to believe that any single weighting system somehow captures accurately the right credit for any given sequence of campaigns and there’s every reason to think that the credit should vary depending on the order, time and nature of the individual campaigns." This is typically when an organization invests in a premium (or more expensive) software package from their web/digital analytics technology partner, which includes out-of-the-box attribution capabilities. Here is a video example discussing how one of the most popular web analytic platforms in the world includes capabilities for various methods of rules-based attribution. Comparing the attribution problem to soccer (or futbol), and accepting that we cannot give 100% credit to the goal scorer. There is a build up of passes to set up the goal (i.e. purchase), and each of these events (i.e. marketing channel touches) contribute value. Even though names like Messi, Ronaldo, and Neymar are commonly known in soccer, ignoring names like Iniesta, James Rodríguez, or Schweinsteiger would be a travesty. The difficulty I possess with the video is leveraging the term "data-driven attribution" when rules-based methods are the only approaches highlighted. In my opinion, we are only grazing the surface of what is possible. Algorithmic attribution, on the other hand, assigns data-driven conversion credit across all touch points preceding the conversion, using data science to dictate where credit is due. It begins at the event level and analyzes both converting and non-converting paths across all channels. Most importantly, it allows the data to point out the hidden correlations and insights within marketing efforts. Have you ever wondered why web/digital analytic software doesn't include data mining and predictive analytic capabilities? It has to do with how digital data is collected, aggregated, and prepared for the downstream analysis use case. Web/digital analytics has always had a BIG data challenge to cope with since it's inception in the mid 1990's, and when the use case for users is to run historical summary reports and visual dashboards, clickstream data is collected and normalized in a structured format as shown in the schematic to the right. This format does a very nice job of organizing clickstream data in such a way that we go from big data to small, relevant data for reporting. However, this approach has limited analytical value when it comes to attribution analysis, and digital marketers are only offered rules-based methods and capabilities. 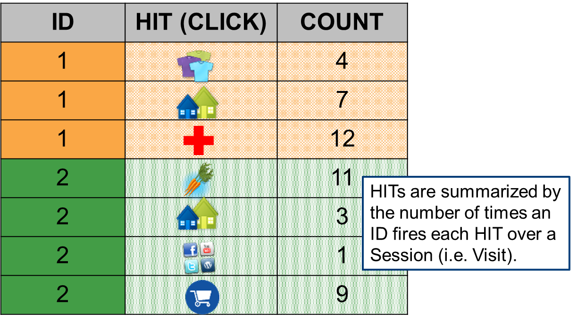 Ultimately, the data is collected and prepared to summarize all click activity across a customer's digital journey in one table row. The data table view shifts from being tall and thin, to short and wide. The more attributes or predictors an analyst adds, the wider the table gets. This concept is referred to as preparing data for the analytic base table (or input modeling table). 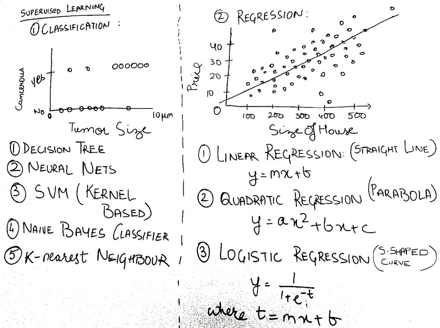 This is the best practice for advanced algorithms to be used to fit the data. Shhhhhhhh! We'll keep that insightful secret between us. More importantly, don't let this intimidate you if you're new to these concepts. It boils down to the ability to reshape granular, HIT-level digital data for the best practices associated with data mining. Can it be done? Absolutely, and algorithmic digital attribution is a prime example of big data analytics for modern marketing. The question I challenge my clients with is to consider the arbitrary (or subjective) nature of rules-based methods, and associated limitations. Although they are easy to apply and understand, how do you know you aren't leaving opportunity on the table? This leads me to the next recent trend of what I observe clients doing. How do you feel after watching these videos? If you are raising your hands to the sky thanking the higher forces of the marketing universe, I completely understand. Many of my clients describe their marketing organization's culture as unprepared for algorithmic attribution, ranging from lack of subject-matter expertise, big data hurdles, or employee analytical skills. There can be tremendous value in selecting an external partner to handle analysis and actionability, and accelerate your ability to make better digital media investment decisions. 3rd party attribution vendors have the domain knowledge, technology, and a track record, right? That's one trend I see. The other trend is when a marketing organization is analytically mature, and this leads me to the next section. Unable to scale digital analytics for algorithmic attribution to measure drivers of conversion and advertising effectiveness. 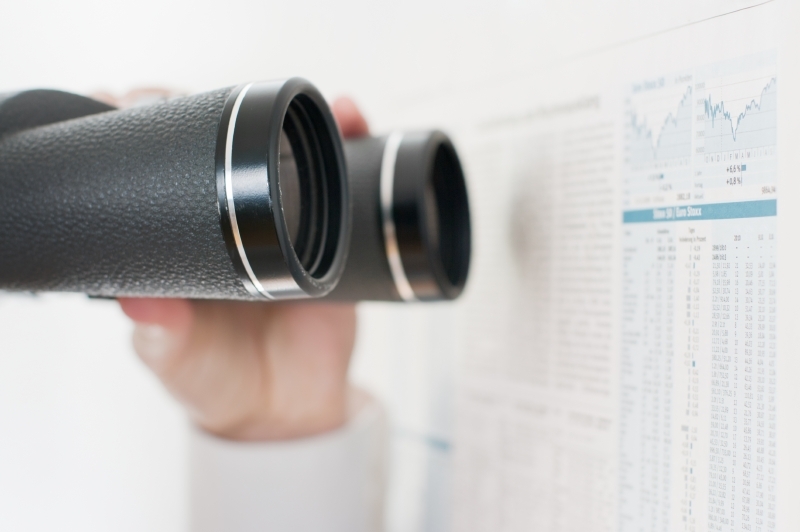 - Insights to allocate future digital media ad spend. 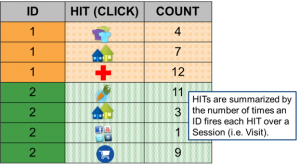 - Rules-based attribution methods largely inaccurate. - Analytical data prep, modeling, and scoring workflow must be capable of processing on Hadoop platform (i.e. big data lake). In this exercise, the hospitality brand was extracting raw data from their relationships with these digital marketing technologies into an internal Hadoop data landing zone. Their goal is to start stitching various digital marketing data sources together to gain a more complete view of how consumers interact with their brand. Analytically speaking, this is very exciting because we can gain a better understanding of the value of channel touches, onsite click activity, media impressions, viewability, creative content, ad formats, and other factors that we do not have comprehensive visibility into with traditional web/digital analytics. One valuable insight I would like to share is if you have never worked with raw clickstream data or display media data before, it would be advantageous to obtain a data dictionary and channel processing documentation from your digital marketing solution vendor(s). For example, every website that has installed web analytic tracking has an array of unique goals, interactions, segments, and other attributes that were configured for that specific business model. Analysts will not understand what eVar 47 is without a translation document. Guess what? eVar 47 is going to have a completely different definition from Brand #1 to Brand #2 to Brand #3. Sorry - there is no easy button for this. Your analysts will thank you sincerely for taking these steps, and it will improve their ability to succeed. Since this is a SAS Blog, I imagine many of you will want to understand how we worked with the raw digital data in this case study. 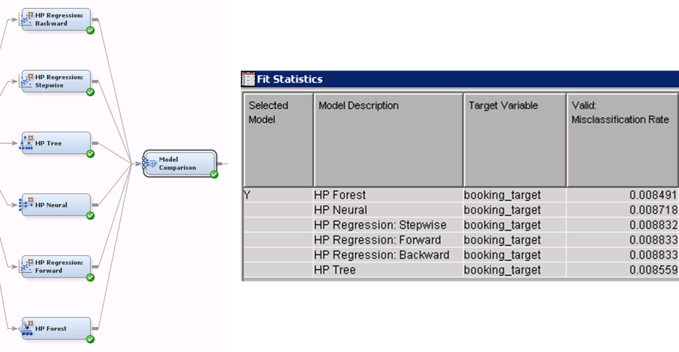 Produce a predictive model that computes the probability of conversion given a set of visitor journey predictors. 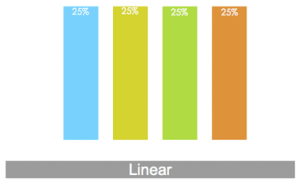 Determine the incremental lift in probability of conversion for each channel in a visitor journey, and use this to compute attribution. Provide insight into the relationship between conversion and the predictor variables (marketing channels, onsite click activity, digital demographics, etc.). 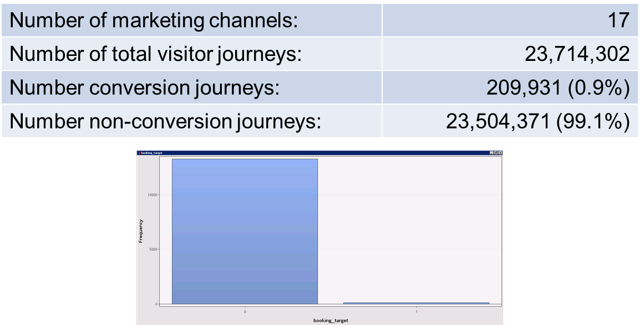 Convert visitor journeys into a table with rows of channel impression counts and conversion information. This data is used to train (and validate) the predictive model. Use the predictive model to compute the incremental lift in probability of conversion by adding one channel at a time in each visitor journey. Process all conversion journeys & accumulate channel credit to compute channel attribution. This analysis included 17 marketing channels, over 1,000 predictors, ~24,000,000 digital visitor journeys, and a rare conversion event occurrence of less than 1%. Oh my! Now let me ask you a question - do you believe there is one piece of math that will solve all of our attribution challenges? Absolutely not. The game of digital media investment is all about precision, precision, PRECISION! 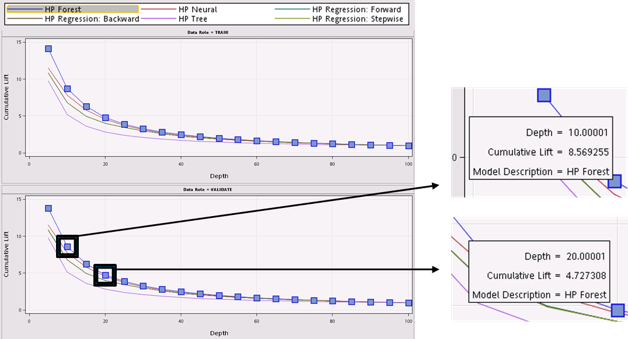 To maximize precision, in the field of data mining, we employ the use of champion-challenger modeling. Simply put, we throw a bunch of math at the data, and the algorithm that does the best job of fitting the data (i.e. minimizing error) is selected. For those of you unfamiliar with misclassification rates, it's nothing more than a metric to summarize how many mistakes our analytical model is making. The lower the value, the better, and in this exercise, the random forest algorithm did the best job in analyzing and fitting our attribution data. There's your champion! The beautiful takeaway in this example is we have identified an attractive segment (top decile with highest probability scores) that is 8.5 times more likely to convert as compared to randomly targeting the entire marketable population. Secondly, if we alter that segment view to the top two deciles, they are 4.7 times more likely to convert. BOOM! This is awesome because we can now profile these segments, and proactively hunt for look-a-likes. In addition, be imaginative in how you might use these segments in other forms of digital marketing activities. For example, A/B testing in web personalization efforts. The odds ratio plot clearly highlights these insights in a non-technical manner. Channels above the horizontal line have a positive impact in increasing the probability of a visitor conversion, and channels below the line have a negative impact. For those of you who are unfamiliar with odds ratio plots, they serve as an ingredient to feed into a marketing dashboard that can explain market channel attribution performance. So how accurate were we? Was this model any good? True positive rate simply means how accurate was our ability to correctly predict conversions. True negative rate summarizes our ability to accurately predict non-conversions. Given that our original event of conversion behavior was below 1% across a three month time window, our ability to predict conversions based on the modeling insights is a MASSIVE improvement (86.67 times more accurate) versus the mass marketing approach (or pure random targeting). Even though there is still room for improvement, these are very promising results. To deploy or activate on these insights, this will vary based on your organization's approach to taking action. It may be the scoring of an internal database, or it might be passing the model score code to your digital data management platform to improve their ability to deliver media more intelligently. There are a number of use cases for marketing activation, but by doing this analysis in-house, you will have flexibility to conform to a variety of downstream process options. Again, I suspect many of you will want to understand how we analytically modeled the digital data in this case study. If you made it this far in the blog posting, I applaud your commitment, desire, and time sacrifice to go on this written journey with me. 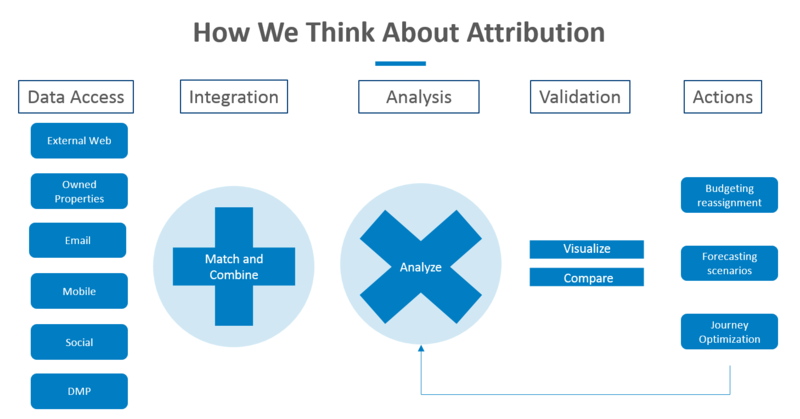 We discussed the current landscape of digital marketing attribution, from methods of approach to providing a real case study in support of making the justification for algorithmic attribution (i.e. it's not a mythical creature from another universe). Digital data mining is on the rise, becoming more approachable, and will provide organizations competitive advantage within their industries for years to come. Let me know what you think in the comments section below. Lastly, if you would like to connect on social media, link with me on Twitter or LinkedIn. Making the case for algorithmic digital attribution was published on Customer Analytics.